And then you see it and realise it looks more like a drowned rat. Sea Drowned Rat. What it really is, is an annelid worm. 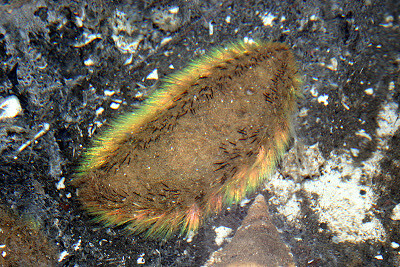 Annelids are the segmented worms, although the Sea Mouse doesn't appear to be segmented or particularly worm-shaped. They are also members of the genus Aphrodita, but don't look much like a goddess of love and fertility. What a peculiar animal! We shall have to get this sorted out. Sea Mice are polychaetes found in the North Atlantic, blindly wandering the seabed using their antennae to sniff out corpses and small, fleshy things to feed on. They reach somewhere between 7.5 cm (3 in) and occasionally as much as 30 cm (12 in) long. A lot of them live close enough to the coast to get washed up at low tide, but they've also been spotted at a depth of 2,000 metres (6,560 ft)! Being polychaetes, they have lots of chaetes. What? Ah, yes... "chaetae", that's the plural! 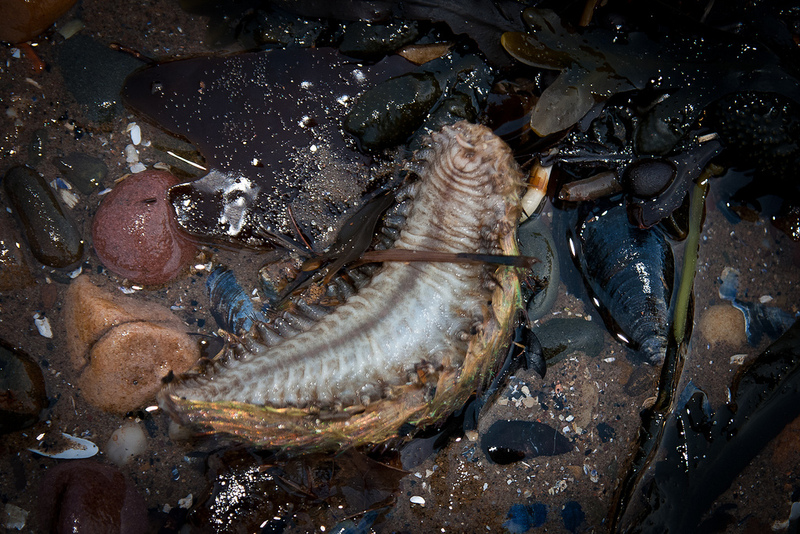 They're the chitinous bristles sticking out of the fleshy leg-type-things that stick out from their sides. Chitin is the same protein that insect exoskeletons are made of, so these bristles are tough and rigid as an old broom. 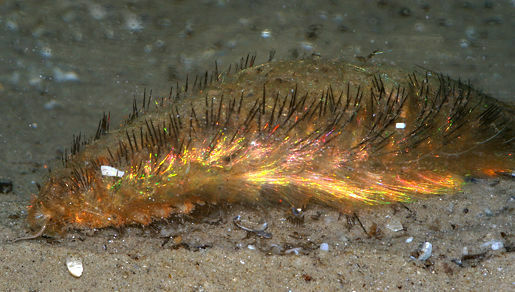 If you turn a Sea Mouse on its back you get to see the leg-type-things, or parapods, moving around in an amazingly obscene way. It's like a nightmarish centipede-bear in desperate need of a pedicure. 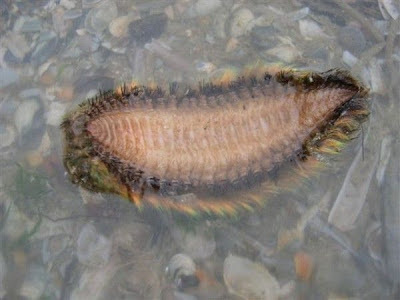 This is how the Sea Mouse walks on the sea floor and burrows into the sand. You can also see the segmentation of the body. Indeed, there is one pair of parapods on each segment, so it IS an annelid after all! After that nasty underside one gains a new appreciation for the "drowned rat" look. It comes from a fulsome covering of yet more chaetae covering its whole body. 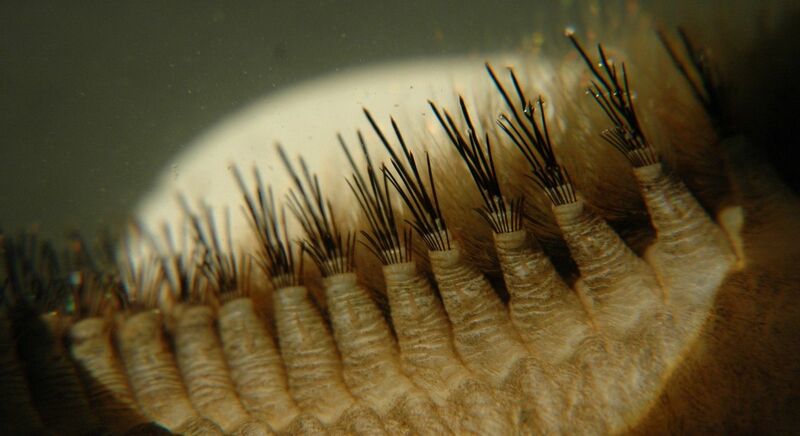 There are tough, hollow spines and soft, fuzzy hairs, and they're all made of chitin. This worm is positively hirsute! But not in the boring way humans are. 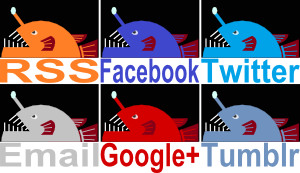 Not only are they a lot more colourful, but they're colourful in a very interesting way. These bristles are not as simple as they may appear. Take those hollow spines. They're hollow, which means there's an empty space surrounded by a wall. But that wall is itself full of holes. In fact, the wall is made up of 88 layers of empty channels surrounded by chitin. Each one of these nanochannels has a diameter of around 200 nm (7.5 x 10^-6 inches, which probably doesn't help), about half the wavelength of violet light! The channels in the soft hairs are even smaller. The channels are arranged in a hexagonal pattern so that they act like crystals. It's called a "photonic crystal", because it controls photons of light like how electronics control electrons. The end result is some of the best iridescence in the natural world. If you look at it from certain angles, the amount of constructive interference from all those tiny channels means that the bristles appear bright red by reflecting just about 100% of all light that enters it! White light goes in, red light comes out. Other colours also come out, but reflection is particularly efficient for red wavelengths. And all this is without the use of pigments. It's known as structural colouration because it all comes from the minute physical structure of the bristles. Not bad for a drowned rat! Not bad for a human either, since this stuff is serious nanotechnology. Synthetic photonic crystals have applications ranging from incredibly precise blood testing to incredibly efficient light bulbs. And also for distinguishing oneself from a wet mouse, clearly. What is it with that "Mouse" thing, anyway? Why is it called a "Sea Mouse"? Really? Just tell us. Come on, don't be embarrassed... You know you want to! Bits. You know? The Top Secret, Private and Confidential, Need to Know Basis bits. I'm taking genitalia. So there's your Aphrodite. Squirming around on the floor. Turns out that's just the kind of guy Carl Linnaeus was. He may be the "Father of Taxonomy" and the Name Giver in Chief, but in the end, he's a bloke. Although the Sea Mouse is actually hermaphrodite so maybe he should have called it Aphroditus instead? Or even Hermaphroditus himself. Or perhaps ol' Linny was just trying to tell us something. I guess it stands to reason in the end. I mean, those are some really great hairs! It would be a shame to wax them all off just for a swimsuit. Far better for the whole thing to grow legs and entertain itself while you go for a swim. You could even play "fetch". Check out some electron microscope images of the spines in the lower left of this pdf. Another pdf gives a nice overview of structural colouration in a few animals, starting with the Sea Mouse. And big thanks to Dear Reader Su for suggesting this obscene beauty! I had no idea it would turn out quite as interesting as it did. I bet Carl Linnaeus would've been surprised, too. That's probably for the best! Interesting name origin. I wonder if it has a 'special relationship' with the sea cucumber. Hahaha! I'll just say "maybe" and leave it at that. My imagination will get far too fetid if I embark on such musings. My mom always told me that chaetae never prosper. I guess that's the kind of thing parents tell their children. Looks like some chaetae are doing very well for themselves! Compliments on an informative presentation.